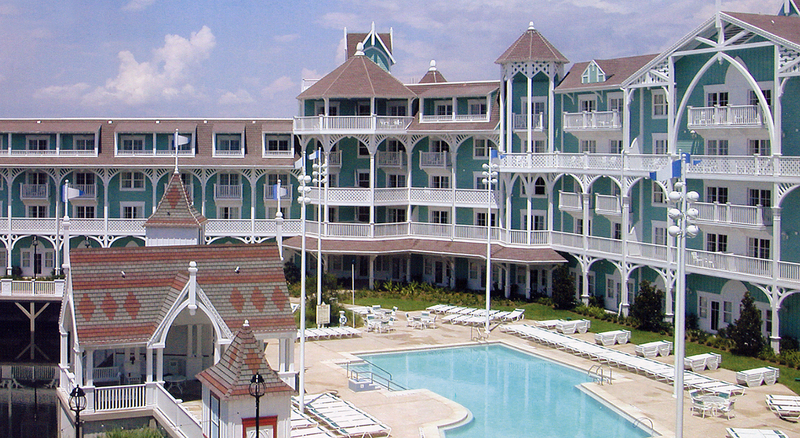 Located adjacent to Disney’s Beach Club Resort, the new Villas reflect the casual elegance and Cape May stick-style architecture found in cottages and hotels that operated along the mid-Atlantic coastline during the early 20th century. The Dunes Cove quiet pool area and a series of garden courtyards surround the resort’s mint-green buildings, which feature decorative bracket work and gingerbread-patterned surfaces designed to echo the style of the adjacent Disney’s Beach Club Resort. Interior public spaces at Disney’s Beach Club Villas include the Breezeway Poolside Member’s Lounge and the Drawing Room, two distinctive rooms detailed with beach-themed artifacts and memorabilia.